Thread connection: 2 7/8" API.Reg. All PDC drill heads have small injectors. 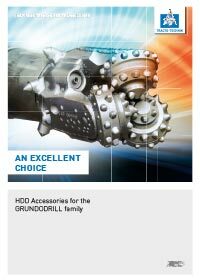 Application range: Soft to medium hard rock The drill head shall not be used to drill through rubble. If you have any questions concerning application, please contact René Schrinner, telephone number 0171 4707380. Advantages: double to triple heading rate in comparison to roller bits. 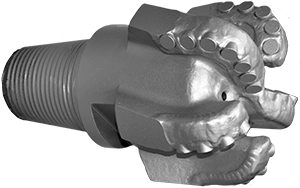 Because the PDC drill cutter bits take a cutting action, they make better use of the steering mechanism and do not slip away as easily as roller bits while starting to drill into rock horizons at a flat angle. Damaged diamond cutting plates can be replaced.